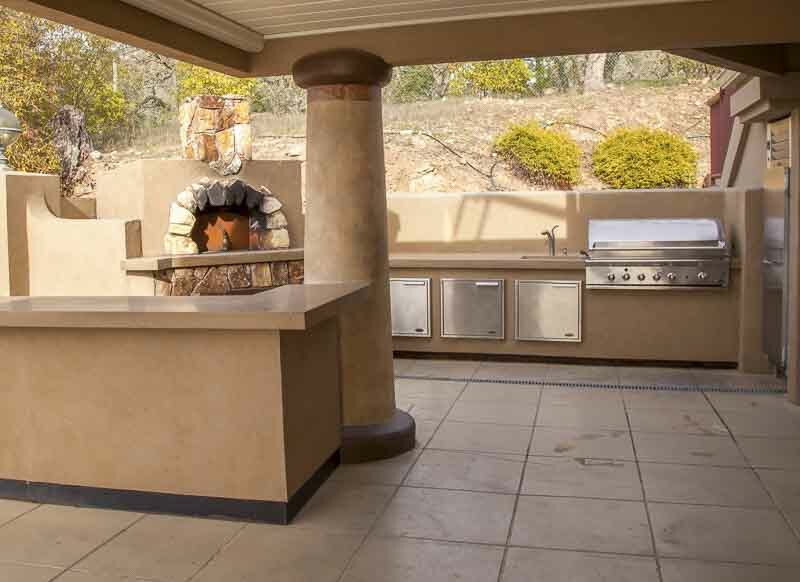 OKC Outdoor Kitchen Design and Construction - Call the experts Today! Our Highest Priority Is Quality And It Shows In Everything We Do. Imagine, a chef’s paradise on your own back patio! 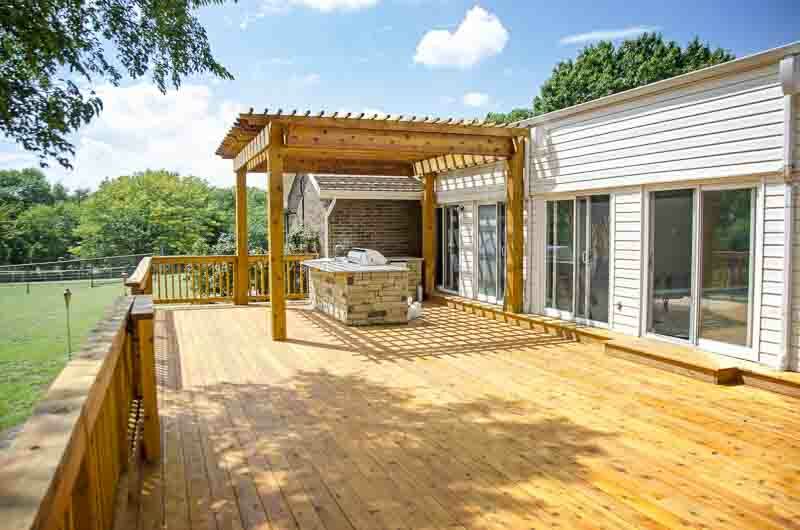 Entertain your friends and family in style with an outdoor kitchen and these amazing features: gas grill, refrigerator, sink, wine cooler, or even a pizza oven. 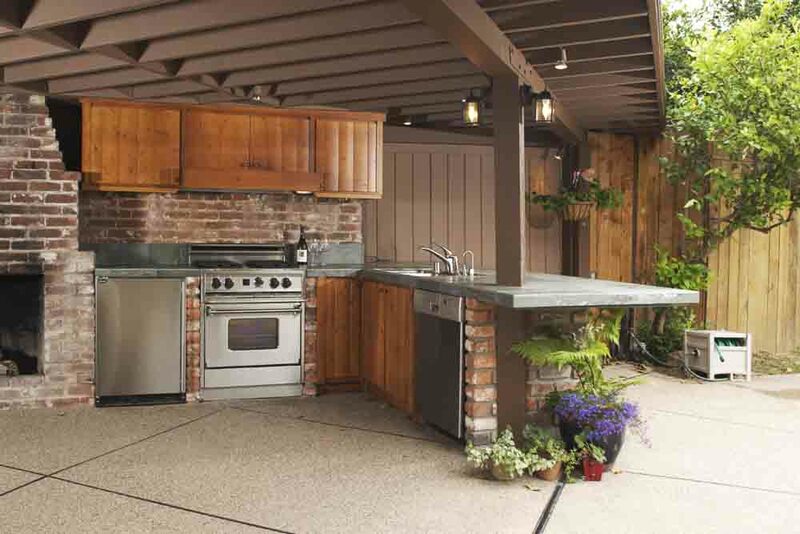 Your outdoor kitchen can be a functional and stylish living space. Whip up your favorite dishes, grill a steak and loosen up in your customized Oklahoma outdoor haven. The sun is out, the day is warm - it’s time to grill some steaks! Do you dream of barbecue ribs, sizzling hamburgers or skewers of roasted vegetables? 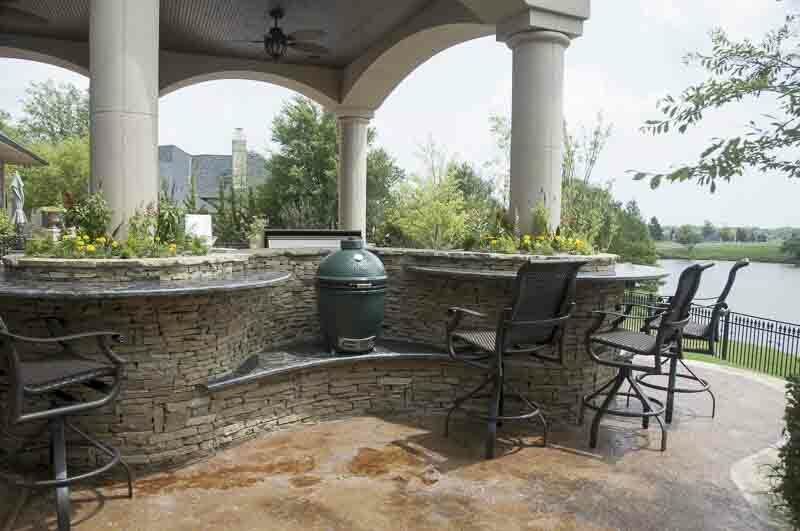 If you do, then now is the time to have a customized outdoor grilling station built right on your backyard or patio. 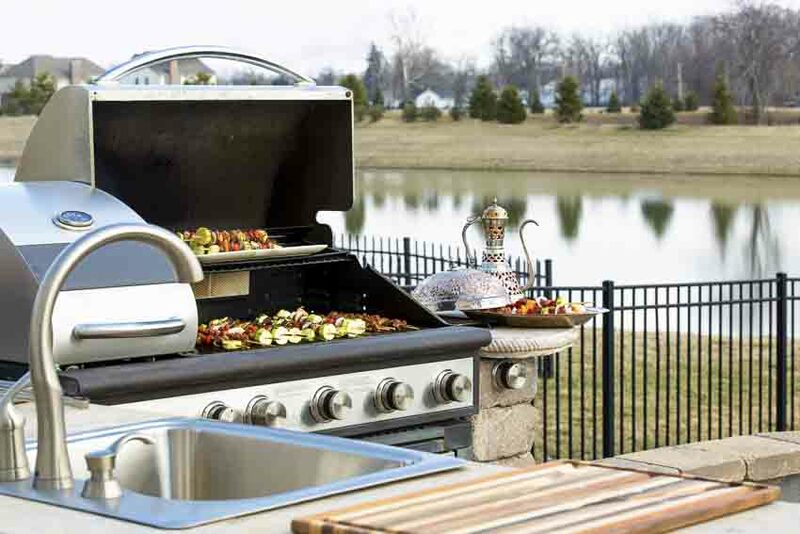 From grills to pizza ovens, your grilling station will be the ultimate outdoor kitchen experience. Relax, cook and entertain in style, no matter the season. With proper coverage and preparation, your grilling station can be enjoyed all twelve months of the year. Excellent preparation and planning of outdoor kitchens will pay off in the long run. Your needs as a grill master are the number one priority when planning your outdoor cooking area. Your cooking area should be convenient, functional and beautiful. Will my station have a sink? If not, you might want to build it close to your outside door so you will have easy access to your inside kitchen sink. However, choosing to have a sink installed in your grilling station will save you time and trouble in the long run. Rinsing vegetables, washing hands and utensils, etc. can easily be handled in your outdoor sink. Installation of a sink does involve plumbing lines for the water, so that will need to be included in your design plan. Do I have a current gas line or will I need to run one to the grilling station? If your back patio has a gas line, then placement of your grilling station can be made on your current slab. If you choose to build further out, then your gas line will need to be extended beneath the ground to reach your new outdoor kitchen. This, of course, is if you are choosing to have a gas grill. A propane grill doesn’t require a gas line. If your patio doesn’t have a gas line, our installation crew can install one for you. Who am I accommodating outside? If you have a pool and want easy food access for your swimmers, then you can have your grilling station built closer to your pool. 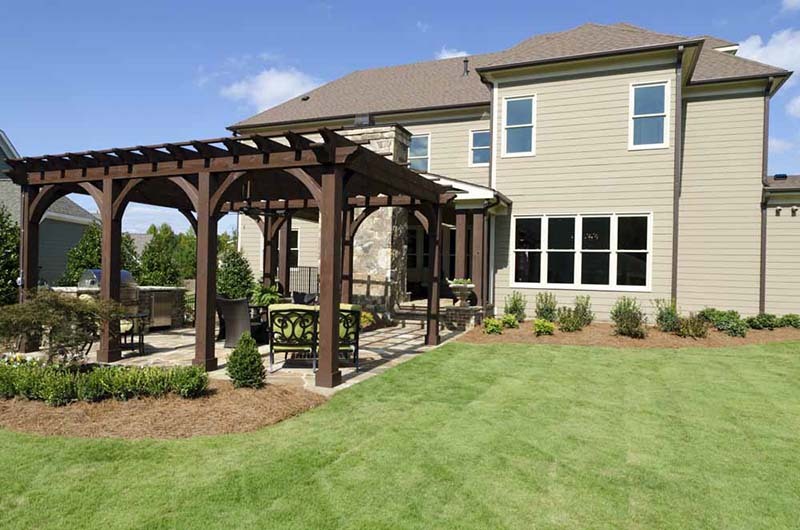 If you have another outdoor entertaining area that needs to have easy food access, then you can build it closer to that. 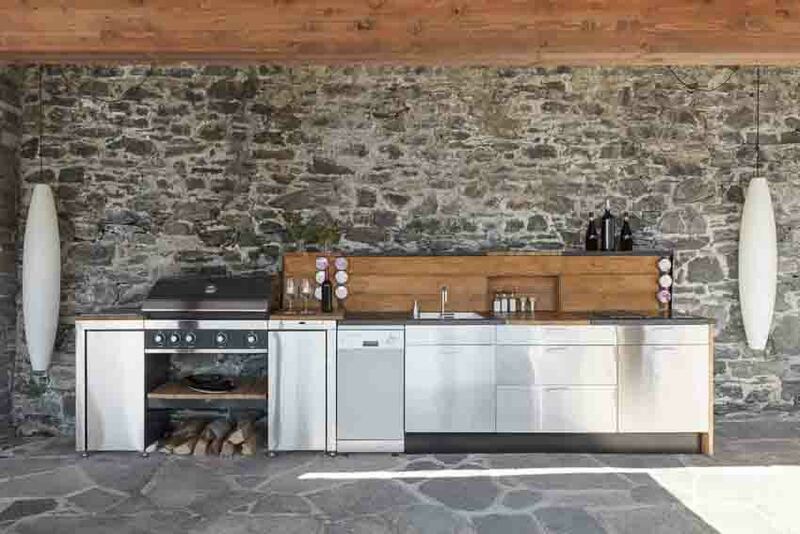 Just remember that you will need electrical and possibly gas hookups for your outdoor kitchen, so that will need to be considered during the planning stage. Do I want to be close to my inside eating area and kitchen? If you plan on eating a lot of your barbecue food inside, then having quick access to your interior is a good choice. Building your grilling station beneath your current patio, or on a stab poured next to your backdoor will make grilling easier for you. This is also a good option for grillers who are on a tight budget. This will allow you to forgo extra outdoor appliances like a small refrigerator, warming drawer, or sink. What type of clearance for ventilation will my grill have? Placement of your grill is critical if you are building your outdoor kitchen beneath a structure such as a covered patio. There needs to be plenty of clearance between the grill and the roof base for adequate ventilation of heat and smoke. If your desired placement doesn’t have adequate ventilation, vent hoods are available options to vent the heat and smoke through the roof of your covered patio or pavilion. 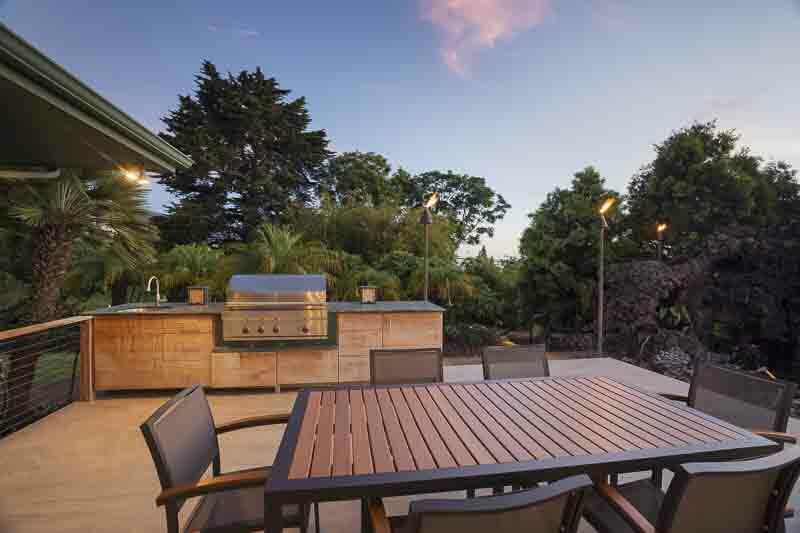 The design of your outdoor barbecue is virtually unlimited. Not only can the shape and design be customized to suit your needs, but there are there several materials that can be used to build your station. Each material adds a different feel and style so choosing your outdoor kitchen material is strictly an individual preference. 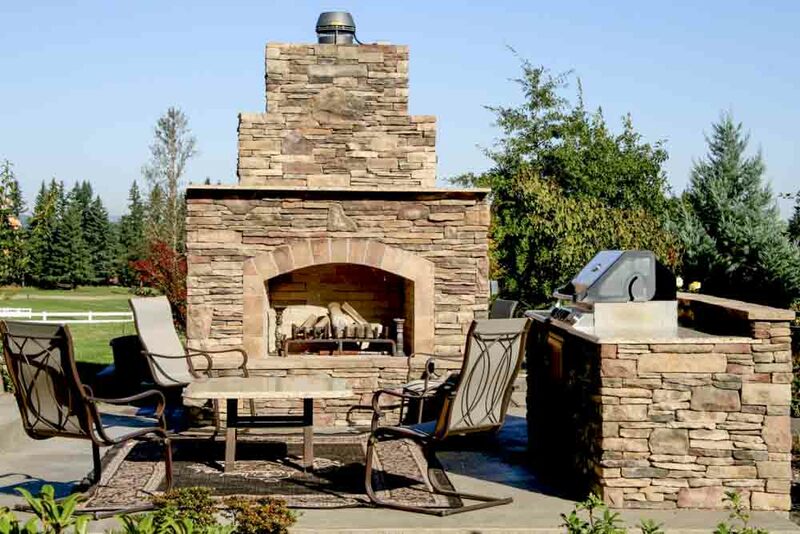 Some materials, such as stone or brick, withstand weather better, but each material is excellent for building an outdoor kitchen. Refrigerator – Small refrigerators make life easier for the chef. Keeping meats cold until they are ready to be cooked is the safest method for grilling. Also, keeping drinks cold for guests, and refrigerating other ‘ready to cook’ foods makes cooking outside a breeze. Side Burner – If you love to add side dishes to your meal, then a side burner is a great option. Side burners come in single, double or quadruple burner, units and make cooking an entire meal outdoors a breeze. Make your meal a masterpiece by sautéing mushrooms, cooking vegetables, or simmering a simple sauce. Perfect for your meal! Ice Bucket – If you love keeping your drinks chilled, then an ice bucket is for you. Ice buckets can be built into your outdoor kitchen counter-top, and have a stainless steel lid to keep those drinks nice and cold. It also makes it handy for guests to just grab a drink and sit back and relax. Kegerator – This isn’t your average beer barrel. Kegerators are hi-tech kegs that not only keep your beer cold, but keep it on tap for a fresh, frothy pour. The ultimate way to enjoy the game and a steak! Wine Refrigerator – Wine is the drink of choice for many homeowners. So what wine expert wouldn’t love a chilled glass of wine while they cook and entertain outdoors? Wine refrigerators are designed to keep your wine cooled to the perfect temperature, while also providing a safe place to store your wine and preserve its smooth taste. Warming drawer – As most chefs know, timing is everything when it comes to cooking. However, we are all not Bobby Flay, and timing our food to be ready at the same time can be a challenge. While your steaks sizzle on the grill, keeping those veggies nice and hot in a warming drawer will guarantee your status as ‘master chef’. Warming drawers are also the perfect way to keep the food hot and ready for guests who may not be ready to come out of the pool to eat! Pizza Oven – Come and get it, hot and ready pizza! The ultimate in outdoor cooking, having your own pizza oven simply can’t be beat. Whether you want a small, single pizza oven, or one large enough to accommodate pizza for a crowd, your pizza oven can be customized to fit your grilling station and your budget. Sink – Having an outdoor sink, is by far, the most convenient way to cook outdoors. Whether its washing vegetables, or hands, your outdoor sink will make your outdoor cooking adventures far easier. No more running back and forth to the house! Griddle – Griddles aren’t just for pancakes anymore (although who doesn’t love a good pancake?). Griddles are great accessories for your outdoor grilling station by allowing you to increase your cooking repertoire. Great for cooking sandwiches, bacon, and a host of other foods, a griddle can enable you to use your grilling station for virtually every meal. There are almost as many grills to choose from as there are foods to cook! However, there is something important to remember – all grills are not created equal! Not only do prices range from a couple of hundred dollars to a few thousand dollars, but their functions can be extremely diverse. Each type of grill produces its own distinctive flavor and influences cooking time. Also, did you know there is a difference between barbecuing and grilling? Barbecuing is cooking with your grill lid closed in order to slowly use circumvented hot air to cook the meat. Grilling is cooking with the lid open and using searing heat from the bottom of the grill unit. Fortunately, most outdoor grills allow you to utilize both types of cooking. Understanding your needs as a chef is the most important factor in correctly choosing the type of outdoor grill. Not only will you want to keep the price within your desired budget, but you also need to understand the advantages and disadvantages of each type of grill. Propane – Propane grills utilize a canister of propone gas instead of a gas hook-up. This type of grill eliminates the need to run a gas line and can be more economical since it eliminates the need for a plumber. 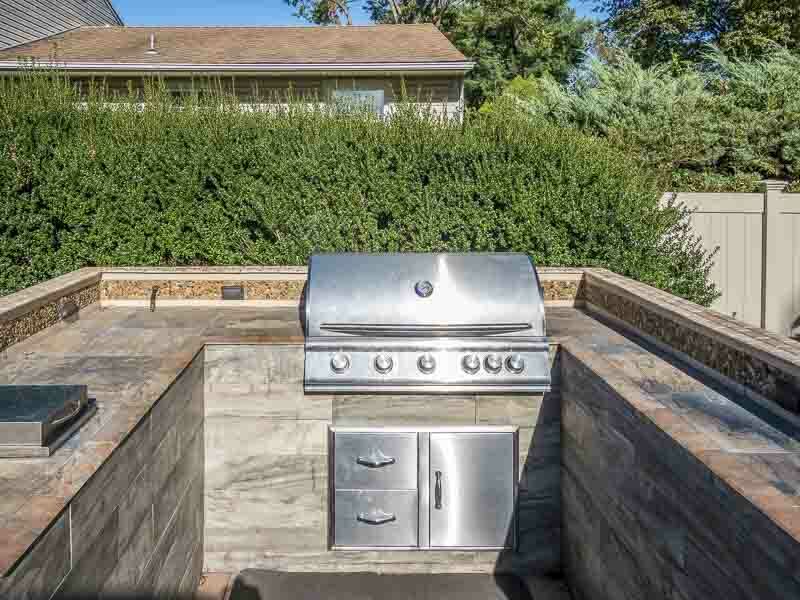 However, it does not offer the convenience of a gas grill. Propane tanks must be replaced at a local deal when they run dry. This is an added cost each time you make a tank exchange. Charcoal – Charcoal grills have been around forever, making them a favorite for those not ready to embrace the current high-tech world of backyard grills. And while they do produce a desirable smoky flavor in meats, many homeowners are put off by the dirty job of expertly stacking the coals to produce the best heat and flavor. Charcoal grills are also harder to clean because of the persnickety nature of soot. Gas – Gas grills are extremely popular because of their ease and efficiency. Lighting a gas grill is as simple as pushing a button. These types of grills are great for chefs who like to get their food cooking quickly and easily. Their simplicity of use also makes them easy to do quick, nightly grilling. Cooking temperature is easily controlled and they are also extremely easy to clean. Some chefs do not feel that gas grills give them the flavor of other grills, but that can easily be fixed in how you season and prepare your meats. Electric – Electric grills are not as popular as their grilling counterparts. Powered only by electricity, they cook using heated grill plates. Some electric grills are designed to reduce the fat in your food, an obvious advantage. Another advantage of the absence of flame or combustible tanks. While these are great features, an electric grill doesn’t necessarily give that ‘grilling’ feeling that many outdoor chefs desire. 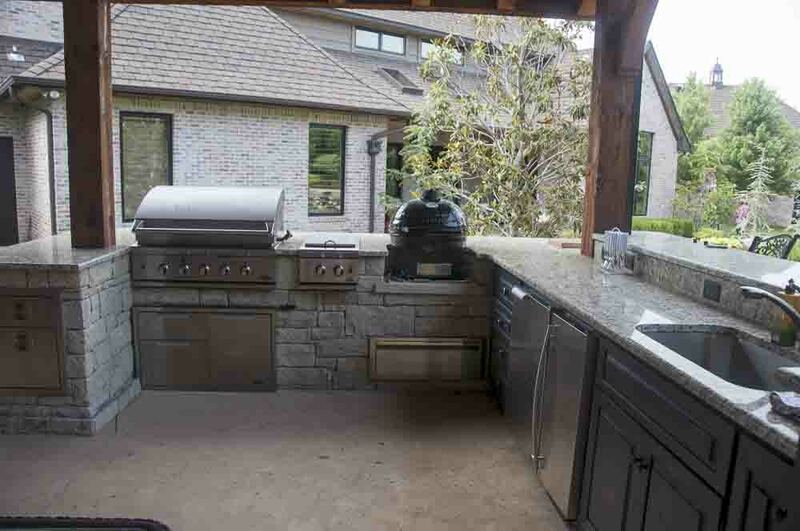 Protecting your outdoor kitchen is extremely important. You want to have a long shelf life for your investment and placing it beneath an outdoor structure is an excellent way to do that. There are several options to choose from that will comfortably accommodate your budget. 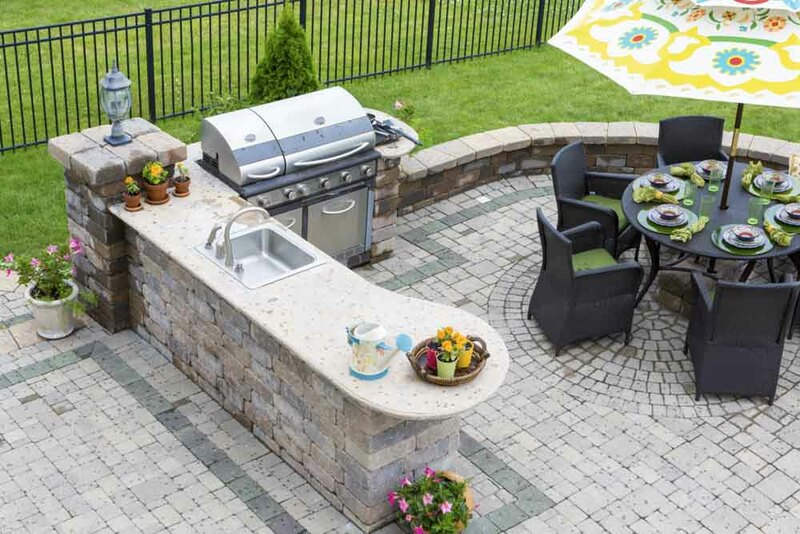 Call us today to connect with an expert outdoor kitchen contractor, who will work with you to design the ultimate outside cooking area. What are you waiting for? Time to grill!